Trinity College received a A.
Washington Monthly's ranking of 98 out of 224 of Affordable Elite Colleges - Overall Rank was a major contributor to this grade. Set on a traditional collegiate gothic campus on high ground in the gritty capital city of Hartford, Connecticut, Trinity has a preppy-jock ethos furthered by strong academics, excellent athletics, and traditional Greek life. When you visit the admissions office, you look through floor-to-ceiling windows at the football field, a place where the Bantams go years at a time without losing a game. As good as they are, they are nothing next to the squash team that won so many national championships in a row that Sports Illustrated covered the story and the coach wrote a motivational book entitled, Run To The Roar. Describe the type of student who should not attend Trinity College and explain why. The type of student who shouldn't attend Trinity College is one who doesn't take their education seriously. The ones who don't want to help humanity for the greater good are ones to be wary about. Describe the type of student who should attend Trinity College. Why? What is a typical Trinity College student like? Describe the type of person that should attend Trinity College. What are the top 3 reasons someone should attend Trinity College? What was a typical Trinity College student like in high school? Describe the type of person that should attend Trinity College. 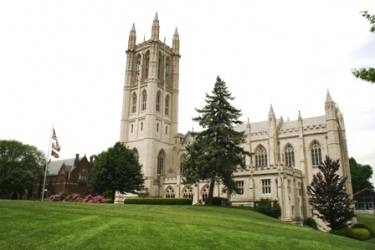 Many Trinity College students attended college prep boarding/non-boarding high schools. They were often at the top of their classes and very well-rounded and involved. Academic standards continue to rise, and students graduate with a strong liberal arts background. Trinity students enjoy constant improvements in both facilities and academics. The school would love to broaden its student demographic. A small liberal arts private school that provides its students with a lot of personal attention and resources. Trinity College looks like a traditional New England liberal arts school. But we act in some untraditional ways. Our commitment to urban-global education, for example, is groundbreaking, as is our interdisciplinary Neuroscience Program and our First-Year Program, one of the earliest in the nation. We have also just added more than 20 young teacher/scholars to our faculty, and our faculty across the board is committed to collaboration with students on real-world research projects. We continue to re-examine and transform the concept of liberal arts education because our graduates expect to thrive and to have a serious effect on the world. Trinity's 10:1 faculty/student ratio means access to teachers who have time to discuss your term paper in person, encourage your research project, and celebrate your success on Commencement Day. Choose from 38 academic majors in the liberal arts and sciences, including one in engineering, another program that is not traditional for a college like Trinity. Twenty-six interdisciplinary minors like human rights, Jewish studies, and African American studies give you even more choices. World-wide study abroad, courses that include interaction with the city around us, and for-credit academic internships give you experience beyond the classroom. And yes, our campus is beautiful in a traditional New England-college way--100 green acres dotted with historic buildings--and it's located in an interesting place, Connecticut's state capital, the city of Hartford. It's home to 2,300 students from 45 states and 47 countries who connect to the College and each other through 100 student organizations, 29 NCAA Division III athletic teams, internships, and volunteer projects. You can learn about all of this here on our Web site--academics, athletics, student activities, and more--but the best thing is to visit Trinity and see for yourself. Campus visits are conducted year-round, and you are always welcome. What are the top 3 things that students do for fun at Trinity College? 89% of students live on-campus. Total stated tuition is $45,300, in-state and on-campus, before financial aid. 38% of students receive some form of financial aid. Learn more about financial aid at http://www.trincoll.edu/admissions/finaid. Estimate the net price for you at http://www.trincoll.edu/depts/finaid/efccalculator/trinitystart.html. The typical (median) early career salary of Trinity College graduates is $47,800, according to Payscale. Trinity College participates in the NCAA Division III for college athletics. Want more info about Trinity College? Get free advice from education experts and Noodle community members.